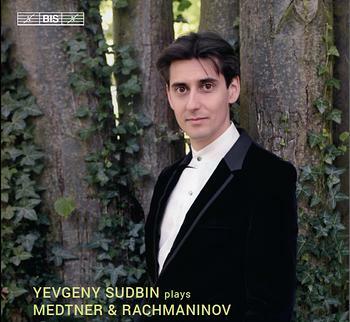 Having previously released recordings of Medtner's three piano concertos as well as three of Rachmaninov's five concertante works, Yevgeny Sudbin on the present disc combines solo pieces by the two friends and fellow-composers. From Sergei Rachmaninov's rich and varied production he has chosen six of the celebrated preludes, including 'Alla marcia' in G minor (Op.23 No.5) as well as the much-loved Prelude No.12 in G sharp minor from the Op.32 set. But Sudbin, who is a great admirer of Nikolai Medtner, opens his new disc with a generous selection of that composer's solo piano music. This section begins with the Prologue from Stimmungsbilder, the eighteen-year-old composer's Opus 1, and closes with Sonata tragica, composed shortly before Medtner left Russia in 1921, never to return. It also includes three of the thirty-some Fairy Tales that Medtner composed throughout his life. ‘No one tells such tales as Kolya’, Rachmaninov used to joke affectionately, and with these pieces Medtner created his own, unique genre. He himself used the Russian word skazka or German Märchen to describe them, and in his liner notes Yevgeny Sudbin suggests that the creative impulse came not only from folklore but also from such diverse sources as Push­kin, Shakespeare and even the Bible. As an interpreter of both these composers, Sudbin has proven himself both in concert and on disc, with previous recordings being named Disc of the Month in Gramophone, 'Essential Recording' in BBC Music Magazine and '10/10' on ClassicsToday.com, to mention just a few of the distinctions awarded them.